T.J Stanford (Basketball) and Cooper Coe (Baseball) were selected to the Beaumont Super Gold Team!! Congratulations to the Lion Baseball team and coaches on another great season!! The Lions advanced to the second round of the playoffs!! Congratulations to the Lionette Softball team and coaches on another great season!! The Lionettes advanced to the playoffs for the 2nd straight year!! Congratulations to the Kountze Intermediate TMSCA Math Club. They attended the annual State Meet in San Antonio and had 4 students place. 2 in the TOP 10 and 2 in the TOP 20! The King’s Regiment Winter Guard show. KHS – Zack Hansel, KMS – Joe Calhoun. 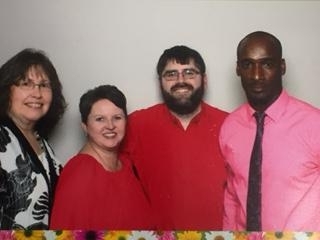 Amanda Collins was selected by the Kountze Chamber of Commerce as the District Teacher of the Year!! The HLS&R Art students were featured on 12NewsNow!! 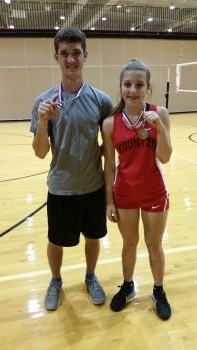 Congratulations to the Tennis Team!! 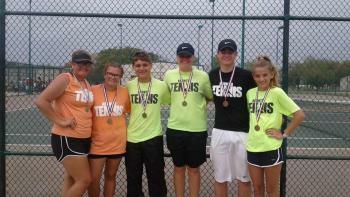 Pictured left to right: Brittney McGallion and MaKayla Linn won 1st place in Girl’s Doubles, Skyler Mordente and William Williford won 1st place in Boy’s Doubles and Paul Anders and Grace Allien placed 4th place in Mixed Doubles. 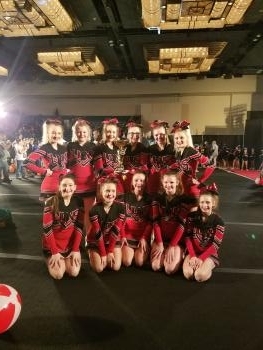 The Kountze Middle School cheerleaders placed 2nd at the American Cheer Power Competition!! Kyra Odom was awarded a scholarship to attend the Western Art Academy. She is one of only 48 students chosen from the pool of HLS&R School Art program participants. The WAA is a four-week program summer program held on the campus of Schreiner University in Kerrville, TX. There she will benefit from in-depth instruction from master artists in the areas of oil painting and sculpture. The scholarship covers the cost of all workshop fees, art materials, housing and food during her stay there. Kyra’s WAA scholarship is the fourth time four years in a row that a KHS student has been awarded a scholarship by the HLS&R School Art program. 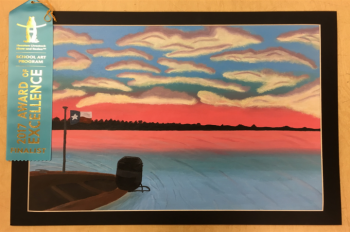 Here is Kyra’s winning art. These artworks can be viewed on Mrs. Allen’s website. Congratulations to the King's Regiment Band. Sweepstakes again!! That's 13 out of 19 years. Great job students and directors!! chromebook roll-out for next year!! Congratulations on another great season!! 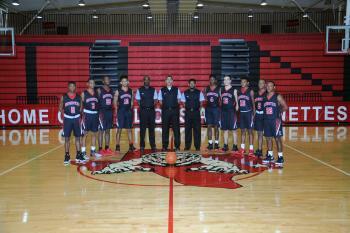 The Lions were Regional Semi-Finalists. Great job boys and coaches!! 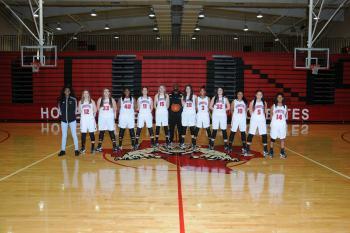 Congratulations to the Lionettes Basketball team!! 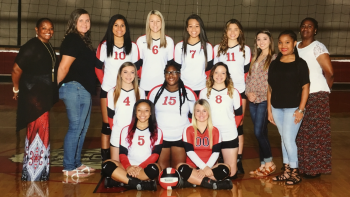 They finished 3rd in district and advanced to the Area Playoff game. Great job ladies and coaches!! 43 out of 45 KHS Band students who participated Saturday have qualified for the UIL State Solo/Ensemble Contest!! 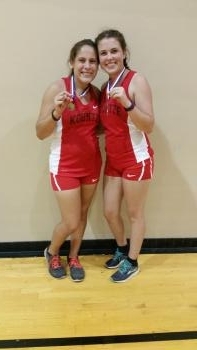 Kountze High School Band students won 60 out of a possible 62 1st Division medals. Click here for a complete list of the students. the Texas All-State Honor Band!! 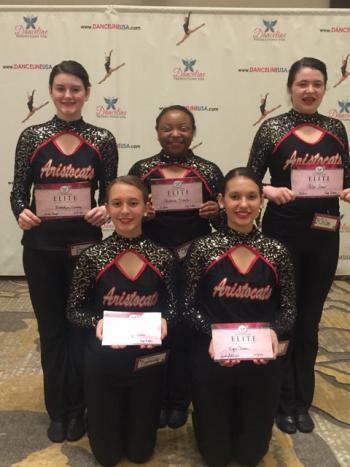 Click here for the King’s Regiment ATSSB All-Region results. We had 15 students qualify for Area!! with a plaque and a $250 check at the board meeting. Click the picture above to see the Chevy Spotlight Video. The King’s Regiment Band competed in the McNeese Showdown with schools from Class 1A-5A (Texas, Louisiana, and Mississippi). They placed 5th out of 25 total bands. In Class 2A they scored a 1st Division. The King's Regiment Band gets straight ones at marching contest again this year. 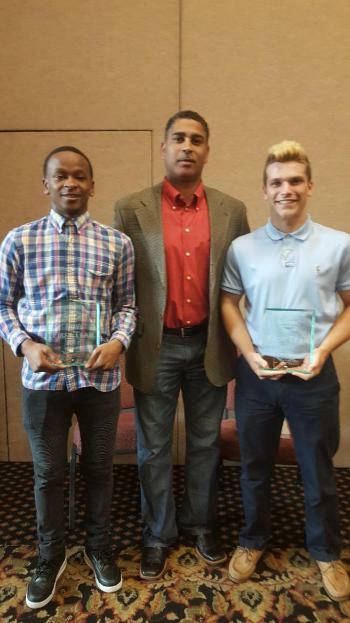 Congratulations students, Mr. Fife, Mr. Long, & Mr. Mere!! Another great job this year!! ATSSB All Region Jazz Tryouts. 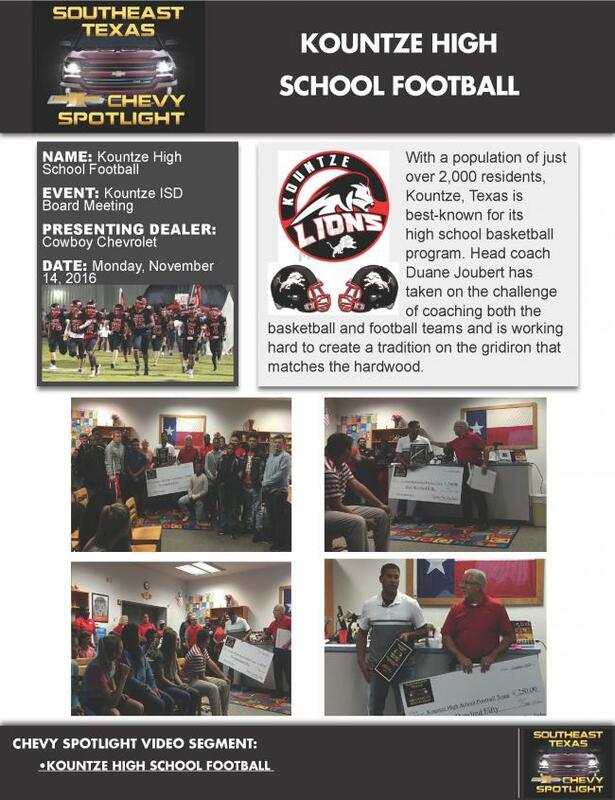 Congratulations to the Kountze Lionette Volleyball Team!! They advanced to the playoffs and were Bi-District finalists! Congratulations ladies and coaches!! 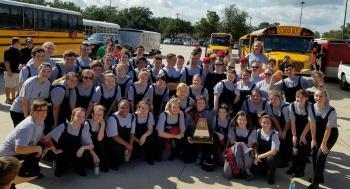 The Kountze High School Band finished 4th in the ATSSB State Outstanding Performance Series Contest Finals! 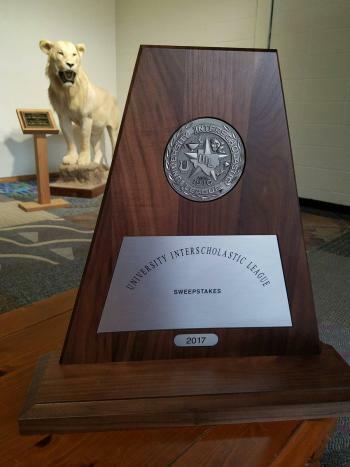 The Kountze Middle School Band finished 11th in the TMEA State Honor Band Contest Finals! Congrats to Mr. Fife and Mr. Long and both bands!! 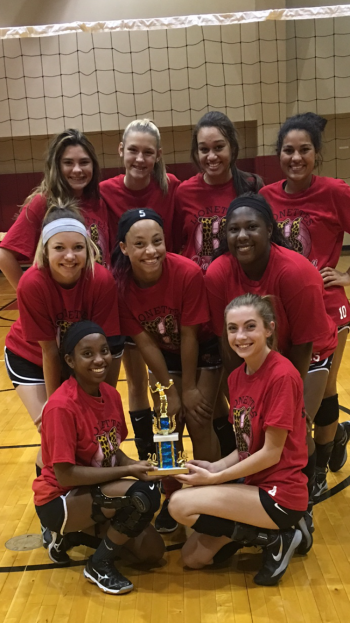 The Kountze Lionettes’ Volleyball team won the Consolation Bracket at the YMBL tournament. 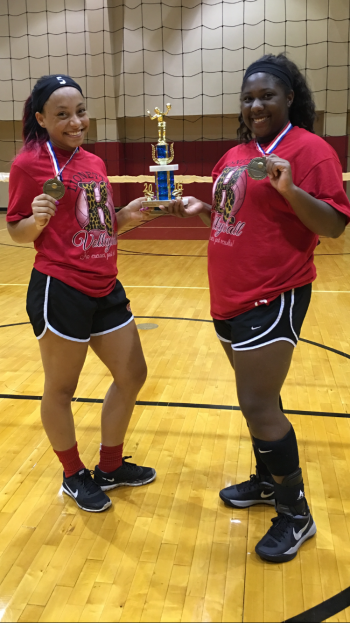 Alexis Orsot and Kiara Cole made the All-Tournament Team!! 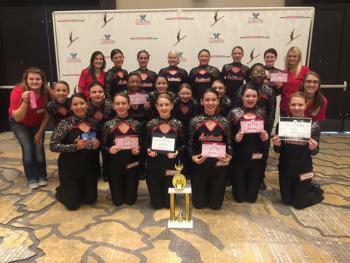 The Aristocats received a Super Sweepstakes Trophy and they were voted Most Congenial Team by the other schools, received 3 Division 1 Superior Ribbons, and they received the RESPECT Award! We also had a few of our girls receive Yellow Ribbons for being Star Performers and one of our managers received a KIRRF (Kindness, Integrity, Respect, Responsibility, and Faith) ribbon.